Organovo's stock tanked in October. Here's why the 3D bioprinting leader should bounce back. 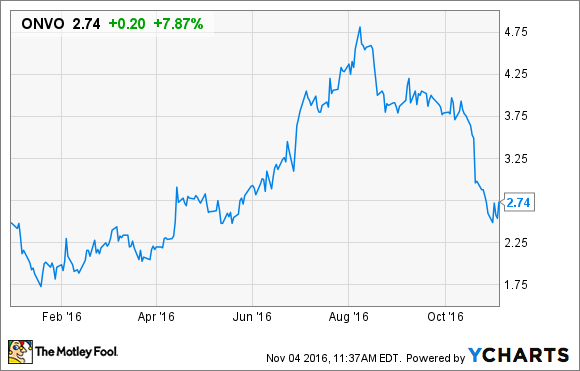 October was a horrible month to own Organovo Holdings Inc. (NASDAQ:ONVO) stock. Shares of the 3D bioprinting company plunged 34% during the month due mainly to a stock offering that diluted existing shares. Organovo now looks poised to rebound in a big way, though. Here's why. What investor wouldn't like revenue growth of 54% sequentially and 358% year over year? That's what Organovo posted in the last quarter. Granted, the company still only made $1.38 million in its fiscal second quarter. That's pocket change for most publicly traded companies. But for Organovo the revenue growth shows that the potential for its 3D-bioprinted tissues is real. It's not just that sales are soaring: Which customers are buying from Organovo is also important. Of the top 25 global pharmaceutical companies, 10 are now Organovo customers. Just three or so months ago, that count stood at seven. Merck (NYSE:MRK) was one of Organovo's earliest customers. The two companies signed a multiyear research partnership in 2015. Organovo CEO Keith Murphy said that the relationship with Merck is going very well. In the last quarter, Organovo achieved a milestone related to custom tissue modeling and received a payment for $400,000 from Merck. Organovo recently launched its second product, 3D-printed human kidney tissue. That launch has gone very well so far, with multiple contracts signed -- including two with large drugmakers. Murphy said that the company thinks the ramp-up for the new kidney tissue will be faster than it was for its liver tissue. Murphy also said that more products and services are on the way. Organovo plans to develop a metabolism service for its liver and kidney tissues. Murphy thinks that the addition of metabolism studies could double the addressable market for its 3D tissues. The company also plans to take a big next step by initiating a pre-clinical development program for a bioprinted human liver. That could be an expensive effort. Murphy indicated that Organovo will consider partnering with another company on this front. Organovo's share price skyrocketed earlier in 2016. While the stock gave up some of those gains beginning in August, the big drop came after the company announced its public offering. Now that the stock offering has been done, Organovo's cash position looks good. The company reported cash and cash equivalents of $51.7 million as of Sept. 30, but that total doesn't include the $25.6 million generated in the public offering. Investors shouldn't have to worry about dilution for a long time to come. Organovo isn't burning through its cash too quickly. In addition, the company's improving revenue picture should mean that its cash utilization trends lower in the quarters to come. All of the reasons why Organovo's stock performed well in the first half of this year remain applicable for the company. More and more customers are using its 3D tissues. Many of them are repeat customers. And new products and services should generate even higher revenue for Organovo. However, the company still has a long way to go before use of 3D tissues becomes an industry standard. In the meantime, Organovo's market cap will continue to be based largely on potential rather than actual results. Any hiccups along the way could cause shares to tumble. Yet I think months like October will be the exception instead of the rule for Organovo. This stock seems poised to bounce back.